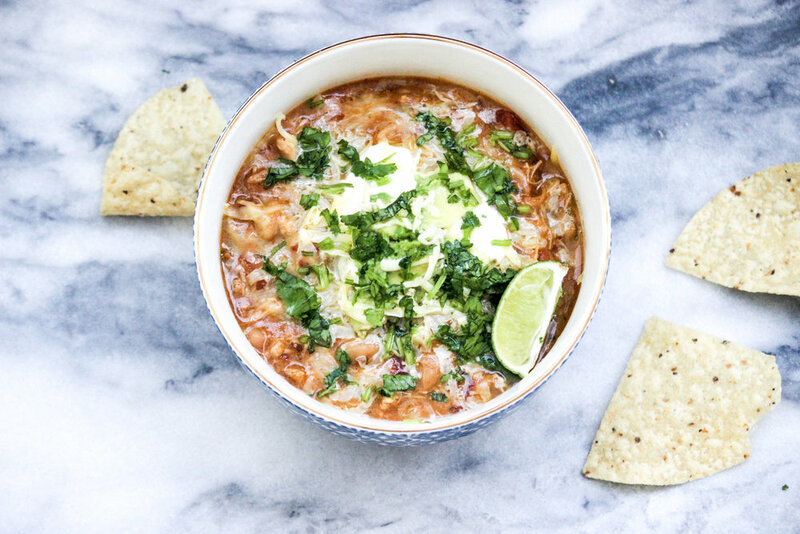 This "almost" white chicken chili is an easy crowd pleaser when the weather cools down, and one of my absolute favorites. Did y'all have a good Thanksgiving? I definitely did. It's always so good to go home, be around family, and eat all of the food. You know what I didn't enjoy? All the posts I saw this year with tips on how to "stay on track" or "how to not overindulge" during the holiday the season. Don't get me started on the number of times I read or heard someone say something about "burning off" their meal with a workout *insert eye roll* Whatever happened to just eating and enjoying your food without guilt? Being healthy isn't about eating perfectly 100% of the time. It's about finding a place of balance in your own life. For me, that looks like enjoying all that Grandma has to offer on Thanksgiving, without feeling an ounce of guilt, and then returning to how I normally eat over the next few days (after a few leftovers of course). How you find balance might look different for you. The point is, there shouldn't be any guilt + shame associated with food. There's no need to punish yourself with a workout or go on a "detox" after one meal. I think it's important to eat in a way that leaves you feeling good. So obviously, diving face first into the stuffing if you have a gluten allergy may not be the best idea. But, if you don't have to have any serious restrictions in place, there's nothing wrong with just enjoying your favorite dishes. Food is fuel, but it's also what we gather around, how we connect, and how we share love with one another. So enjoy good food with good people, be present, and just live your life this holiday season. There's no need to beat yourself up because you ate that mac n cheese. Ok, rant over! Now, onto the recipe! One of the things I love when the weather starts to cool down is an easy chili or soup recipe. Recipes that don't require a ton of "hands on" cooking time are some of my favorites. Don't get me wrong, I'm all about spending time in the kitchen cooking, chopping, sautéing, and just enjoying the cooking process. But, I also love throwing a few ingredients in a pot or slow cooker and just letting them do their thing while I'm cleaning around the house or tackling my to-do list. Sometimes, you just need an easy, no-fuss recipe to have in your back pocket on those busy days. This chicken chili is that recipe. I was going for the classic "white chicken chili" when I first made this recipe, but because I added diced tomatoes it didn't quite turn out that way, haha. Honestly, I love this just as much, if not more, than the classic version. As promised, this recipe is incredibly easy. You can make it on the stove top or, if you want to make things even easier, just throw all of the ingredients in a slow cooker, let it cook on low for a few hours, and BOOM you've got chili. Heat a large pot over medium high heat. While the pot is heating, season the chicken thighs with one tsp of salt. When pot is hot, add the oil and then add the chicken thighs. Sear the chicken thighs on both sides until golden brown. Once the thighs are brown, add in all of the remaining ingredients, EXCEPT the coconut milk and stir to combine. Simmer on medium low for 30-45 minutes or until the chicken is tender and easy to shred. Once the chicken is tender, use two forks to shred it in the pot. Then, add in the coconut milk and stir to combine. Give it a taste and a little more salt if needed. Let simmer for 5 more minutes and then serve with your favorite toppings! Place all of the ingredients, except the coconut milk, in the slow cooker insert and cook on low until the chicken is tender and ready to shred. Roughly 4-6 hours on low or 2-4 hours on high. Then, shred the chicken and add in the coconut milk. Cook the chili for another 15-20 minutes in the slow cooker and then serve with your favorite toppings!